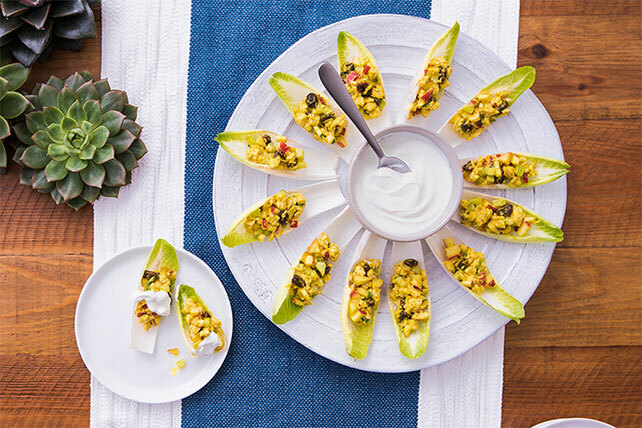 Get both crunch and flavor from these Curried Chicken Appetizer Bites. Apples and curry powder give these Curried Chicken Appetizer Bites their flavors. Combine all ingredients except endive leaves and sour cream. Prepare recipe as directed, substituting 16 mini pitas, cut in half, for the endive leaves, and filling each pita half with 1 Tbsp. chicken mixture before topping with the sour cream. Prepare recipe as directed, but do not top with sour cream. Arrange filled endive leaves in single layer on platter. Refrigerate up to 2 hours. Top with sour cream just before serving. Omit sour cream. Serve chicken mixture with your favorite crackers instead of the endive leaves.